< Merry Christmas! Life, Tracking, Trees, and a Painting. Thank you, Denis! I wasn’t sure if I should post this one. I still feel very insecure with pen, but I will keep pressing on. I appreciate your feedback! I wonder what he’s thinking…. you’ve got the character spot on as always! Thanks so much, Nexi! Do you think a drawing or painting of just an eye would be strange? Lately I’ve been thinking of doing eyes. lol. Anything goes these days… sounds interesting! Thank you, Tom! I really appreciate your feedback. I almost didn’t post this one. Especially with pen, it seems we never know how it’ll turn out. Thanks for your encouragement, I really appreciate it! Thank you, Donna! I’m so glad you’re happy with it. I wasn’t sure about the pen lines at all and almost didn’t post it. I was happy with the shape though and my husband liked it, so in it went! I’m glad to hear you have your mom’s work to remember her; that’s awesome. I do think you have the artistic skills too; look at your beautiful photographs! I think with drawing, it’s a matter of daily practice, like everything else. I used to think you had to have a gift. Well, I knew I didn’t have it, so I gave up. Not sure why but something drove me back to art a year ago as an empty nester, and a daily practice has really made a difference. I think whatever you focus on, you’ll get better at. My two cents. I love this one. I think it’s absolutely beautiful as is. No doubt a watercolour version would be great too though. Thanks! If I knew how to watercolor, I do think a mallard would be a great subject. Tried it last night and it was not to be lol. Oh well, on to the next thing, right? I think iridescent feathers are definitely a challenge! Oh yes, they definitely would be. Aww yeah, I can see that too, now you mention it, Kathy! Thanks! Glad you liked it! Wow, but I didn’t know your daughter paints! What’s her medium? This is awesome! Beautiful job Laura! The sketch is beautiful. Watercoloring it would be amazing too, but it is truly lovely all on it’s own. You have a way of bringing things to life through your sketching. Thanks for sharing your amazing talent! Love it! Thanks Jodi! I appreciate your thoughts on this. I almost didn’t post it because I was unhappy with some of the pen lines. Pen is its own animal, so much to learn with every medium I try. Some pull me in more than others. It’d be helpful for me to focus on one medium, but I don’t think it’ll happen anytime soon. I have art ADD, I guess lol. I did try this in watercolor last night and it’s much harder than it looks. I also have no patience, which is not helpful lol. A watercolor mallard is a project for another day. Maybe it’s one for you to try! Happy Sunday to you! What a stately duck and with minimal line work. He look very courageous, just like you Laura! Aww, Sharon, you are so sweet! What a kind thing to say. I’m a big chicken, actually, but thanks to you, I’ll wear my Courage Crown today, lol! I’m glad you liked this. I almost didn’t post it because I was unsure about the lines under the neck (and others too). So much to learn with every medium, Sharon! I sometimes wonder if I should focus on just one. But I don’t know if I could. Any words of wisdom? Thank you; I really appreciate it! (I’m not sure if I can do it, but that’s a whole different matter lol.) What about subject? Faces was a step in the right direction, I think, but I wonder if I should limit myself to a certain type of face? I sometimes become overwhelmed at the many possibilities of subjects and mediums. I think what you are doing is great. For now stick with animals and birds, if you are loving the subject. Keep it simple for yourself and that will help take the overwhelmed feelings at bay. And yes, Art has endless possibilities! If you are determined to improve your drawing skills, then just stick with drawing for a while. Just a sketch pad, pencil or pen can help minimize the anxiety! I agree, the abundance of art styles can get you off track…stay strong and focused though. Keep that courage crown on, lol. I don’t draw many portraits. They are one of the most difficult challenges for me. Time to do more practice!! Have a great day. You definitely did capture the essence…I would hang this…and many others…..on my wall! Thank goodness they’re small! Aww, thanks CAS! I really appreciate that. I shall keep on trucking, really enjoying this face challenge. And I seem to be hooked on pen lately! I’m really glad you feel this is worth framing. Very kind of you to say. Happy Sunday! Very nice indeed. I would love to see this in color! Thanks, Carmel! The watercolor painting was not to be. At least for now. I need much more patience for it these days. Glad you like the sketch though! Your birds are always so amazing, Laura!! Love this one…great expression. 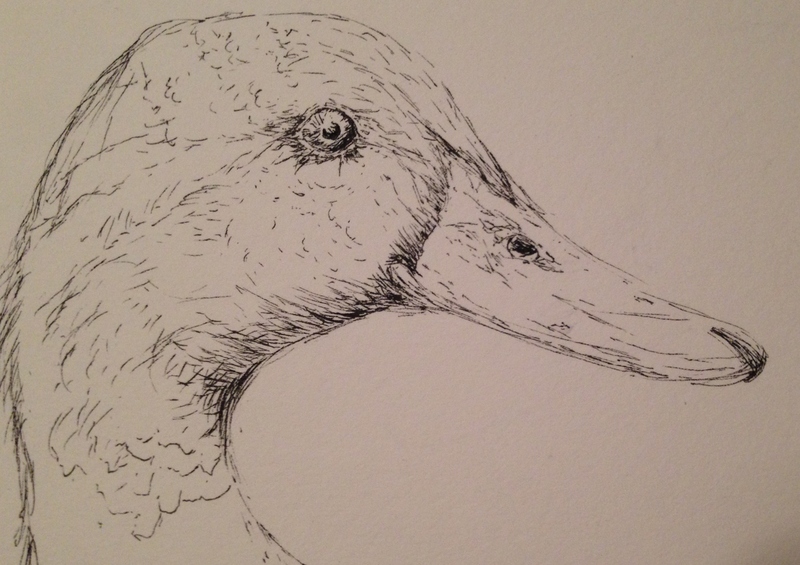 And yes…of course I’ll agree… doodlewash that duck!!! Hehe 😊💜🎨🐦 Can’t wait to see it! Hope you have an amazing Sunday sis!! Thanks Charlie! It’ll have to wait til I have more patience, I think (the color)! Glad you enjoyed it! Have a great Sunday! Beautiful drawing of this mallard. Th colors will be beautiful. I agree with all that has been said before me. This is a lovely sketch! I can’t wait to see what you do with it with your watercolors. I also like the eye very much. Yes, the color version will be beautiful but I think it takes a talent to capture the personality in black and white and you did it perfectly. Wow, I appreciate that, Laura. Thanks so much! Glad you posted this Laura! Also happy to see and read, “Do more of what makes you happy. The world will be a better place if you do” Ditto to that. Have a very good Sunday. Thanks, Susan. My husband got me a mug that says that for Christmas, and boy, isn’t it true? We should all do more of what makes us happy. I added the part about the world being a better place but I wonder sometimes if it really may be just that simple. I’m glad you enjoyed the little mallard. Ducks are so cute! Beautiful sketch Lara! yes i agree, we get inspired by each others post 🙂 Looking forward to more faces! Thanks, Snehal, I can’t wait to see what you’re doing too! Thanks, Margaret! I keep quacking away over here. lol. Beautiful line drawing, sure color can always be added but the drawing is strong enough to stand on its own! Thanks, Jennifer! I’m glad you said that because the painting part didn’t go so well lol. I need more time and patience. I’m glad I left this one alone and tried the painting on a totally different drawing. :)) Thanks as always for your feedback! Nice ink drawing…bird do seem to cry out for color don’t they? They really do. This one will have to wait for his colorful fling but for now I’m happy with the ink. I’ll be doing post soon to promote the work of an artist I discovered a month or so ago. He just came out with a new book and he is a gifted teacher. He is mostly an ink guy but works in a few other mediums too, including some watercolor. Anyway I’m learning a lot for him and really enjoying ink as a result (which I was sure would never happen). There’s so much to learn from other people. Looking forward to seeing your post! Very exciting piece Laura, nice and plump with a beautiful structure to its face. Thanks so much, Mary! Glad you enjoyed him! Thanks, Jill! That one is gonna stay inside my January journal lol. I wasn’t thrilled with it. I think for now, I’m better off with pen and pencil. I disappoint myself when I try to add color – not always, but if I want to be realistic lately, it’s not working out so well. Glad you enjoyed this one! Laura! You have improved immensely since I last logged on. Wow, really lovely! What a wonderful and fun challenge to create a 100 faces for 2016. Great idea!! Thanks, BB! I’m so enjoying pen work at this point. Glad you see some improvement! That makes me feel great! Oh I love this, it is perfect!! I have a thing for ducks in general but you have seriously nailed this. Well done! Thanks so much, Iris! So glad you enjoyed it! Really nice! And you are right. Painting mallard head colors would be such fun! Thanks, Rachel! Especially for someone like you. Ever tried it? No, haven’t tried painting any ducks yet. So many things to explore and paint! Its beautiful as it is Laura. But colour would look good too. Thanks Kath. They are such beautiful birds!